European and Chinese diplomats are making a last-ditch attempt to produce a joint statement for an afternoon EU-China summit in Brussels, with the bloc pressing Beijing for commitments to curb trade-distorting industrial subsidies and to support the rules-based international order. An eleventh-hour deal would signal European and Chinese determination to present a united front in the face of U.S. President Donald Trump’s “America First” challenge to the multilateral system, while a failure would highlight an East-West squeeze on Europe. Qualcomm Challenge | Qualcomm’s two-year battle with the European Commission — over a request for what it says is “far-reaching” information as part of an antitrust probe — will come to a head today when the EU’s lower court rules on the chip maker’s challenge. EU regulators, meanwhile, have already sent Qualcomm a beefed up antitrust complaint. Polish Spat | European Affairs ministers are set to grill Poland again over its democratic standards in a procedure that risks suspending the country’s voting rights. EU pressure is increasing, with the Commission threatening a new lawsuit against Warsaw last week over a justice-system overhaul. May’s Tour | U.K. Prime Minister Theresa May will meet German Chancellor Angela Merkel and French President Emmanuel Macron today as she tries to convince EU leaders she has a plan to break the deadlock at home and only needs to delay Brexit a few months to execute it. The EU is considering pressing Britain to stay for longer, mainly to avoid the prospect of recurring crises. Energy Matters | The Commission is set to publish a progress report on its push to help the European auto industry gain a foothold in the car-battery market and compete with the likes of Tesla. The EU regulator will also evaluate the progress in creating an energy union and put forward a proposal to streamline climate and energy policy decisions. Tariff Threat | President Trump’s administration is proposing tariffs on new passenger helicopters, various cheeses and wines, ski-suits and certain motorcycles in response to harm the U.S. says is being caused by EU subsidies to Boeing-rival Airbus. The threatened tariffs on some $11 billion in imports from the EU is a provocative move and comes as the bloc finalizes terms of a mandate to begin trade talks with the U.S. Slow Moves | European Central Bank policy makers are in no rush to revamp their negative interest-rate policy despite Mario Draghi’s suggestion to look into the matter. With the institution’s April decision due Wednesday, the president’s call to “reflect” on softening the impact on banks has spurred limited action aside from a public debate. GE Fine | General Electric was fined 52 million euros for misleading the EU’s merger regulators during their review of its 1.5 billion-euro takeover of a wind-energy component maker. The decision comes as the bloc clamps down on companies that fail to follow rules that allow it to police whether takeovers and mergers will harm competition. 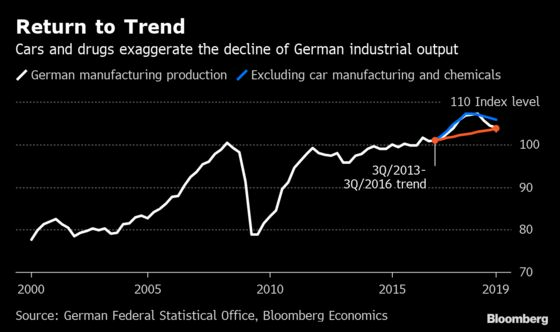 A sharp drop in German industrial output — starting in the second half of last year and stretching into the first quarter of 2019 — has hammered growth and triggered a panicked reaction from the markets. However, a careful analysis of the data by Bloomberg Economics reveals that the drop so far is consistent with a return to the pre-2017 trend, exacerbated by idiosyncratic shocks to autos and pharmaceuticals. The latest indications may not be especially reassuring, but BE’s view remains that German industry is returning to trend, not falling off a cliff.